Your home has a certain personality and is all centred around being yourself, with your family and coming together with friends. A cozy environment to enjoy each other’s company, to kick back and relax. A place of such importance deserves a sofa of equal significance. Meester is designed to give you endless options and varieties to combine elements and to use colour and fabrics. Be your own interior architect, your own stylist and create your very own sofa. Not in a creative mood? Then choose out of a wide range of customer-favorite combinations our One House team has prepared to get the right fit for your living room. All Meester elements can be used combined or as stand-alones. This means, all edges, all sides and even the connecting points are fully upholstered to remain flexible with every piece you buy. No bad side, no limitations and an eye for details in every little corner makes Meester a 100% thought through, high quality furnishing item. You can choose from a wide range of different fabrics and leathers we have carefully selected for you. From organic cotton, to linen blends and easy-to-clean synthetic fabrics - it is up to you! Our leathers are of the highest quality from European producers and offer a soft touch and natural haptics for long lasting pleasure. Meester’s design naturally evolved by interacting with customers for many years. Reflecting on their desired product features enabled our design team to fully understand our users’ needs and wants. Meester unites the best ideas in one sofa, inspired by successful dutch design elements. We set out to produce a sofa that integrates flawlessly into different interior environments. No matter if the apartment has a small footprint or if the country-side house allows for a spacious floor plan. The result is a contemporary, welcoming sofa design with rounded seams that follow the forms of the outer lines. Meester can stand for itself - no matter what your surroundings are like. 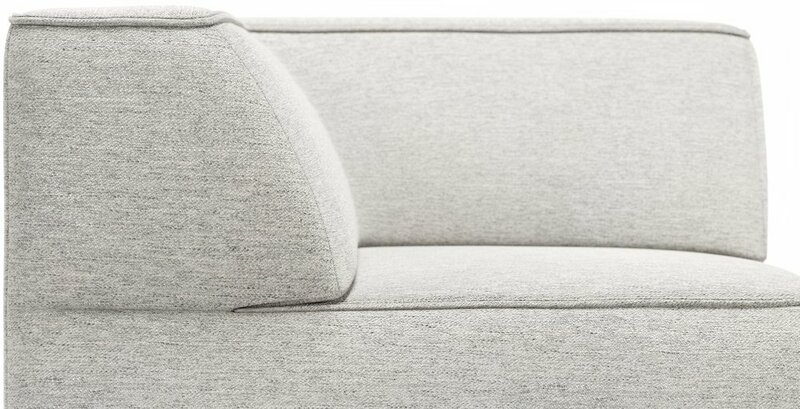 In addition to uncompromising quality and comfort we’ve built our Meester sofa for city dwellers, too! When you make a change in your life, your sofa will easily adapt as well. Anytime you move into a new place or re-arrange your home - simply disconnect and reconnect the pieces in a new combination…and if necessary drop by to get the missing sofa element. Meester sofa always caters to your needs. That’s why we made sure every single module can stand alone if you wish. Find your perfect combination out of 22 different elements! 100% hand-made. But how exactly? Starting with a hardwood beech frame from a sustainable managed forest in Germany, different foams and springs are combined in this masterpiece. Everything is sourced and produced in Germany which results in short logistical distances and hence reduces this sofa’s impact on the environment. Perfect craftsmanship and the love for details blends these elements together with a strive for excellence. No sofa will ever leave the production without a 360° quality control. Made in Germany is what you buy - made in Germany is what you get. Made to last, our armchairs and sofas are covered by a 5 year structural warranty. Protect your furniture by ensuring it sits out of direct or reflected sunlight. Regularly vacuum fabric or wipe leather to remove dust and dirt. Wipe up spills as soon as possible with a damp cloth, for tough stains contact a specialist cleaner. All elements can be used stand alone and have sufficient weight not to move around or connect the modules with the attached crocodile clips underneath each module. We place importance on producing locally, environmentally friendly and focus on the responsible use of resources. Short distances and coordinated logistics are also part of our sustainable strategy. Our sofas are made to order to your specific configuration. The lead time of our sofas is approximately 8-10 weeks. We offer convenient, cost effective delivery options. You can have your sofa delivered to your door, delivered inside of your home or even assembled by our specialist team. You can decide! We forged a partnership with a furniture manufacturer in the North of Germany. Due to this close relationship we can guarantee the highest quality standards for our sofas, perfect production conditions and responsibility for the product from top to bottom. Get creative with these design inspirations. Choose your maximum length and desired depths and you will find a selection of possible options and module combinations below. Download the Favourites and Product Factsheet so you can mix and match. Everything is possible and no space too small to make a Meester work for your home. Looking for the Meester prices per module and surcharges for fabrics and leathers? Want to learn more about colours, materials and characteristics of our fabrics and leathers? Want to see all different modules with detailed information on size and measurements? Looking for sofa design inspiration? The One House team has set up a wide range of possible options and combinations.